Magento is an open source eCommerce content management system used by over half a million online stores and marketplaces. 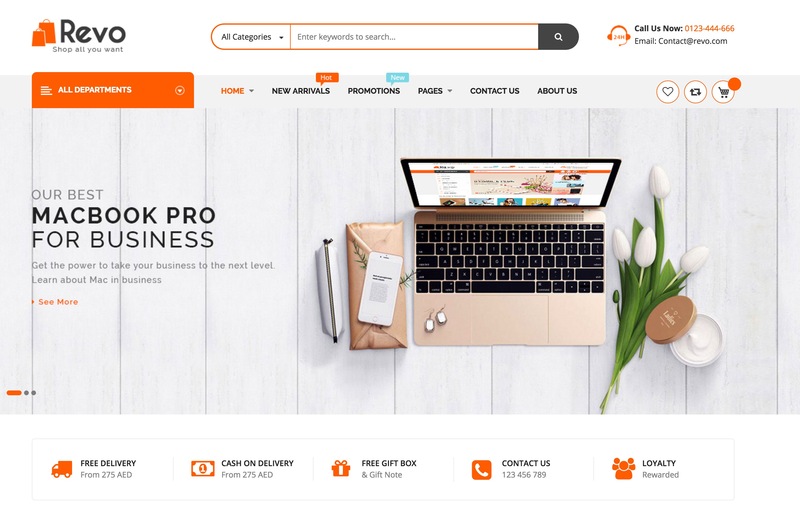 Trusted by small business owners and Fortune 500 companies alike, Magento is a scalable, high-performance platform that also happens to have some great eCommerce website themes and templates. With so many options, however, it can be difficult to know which is the best, much less which is appropriate for your website. 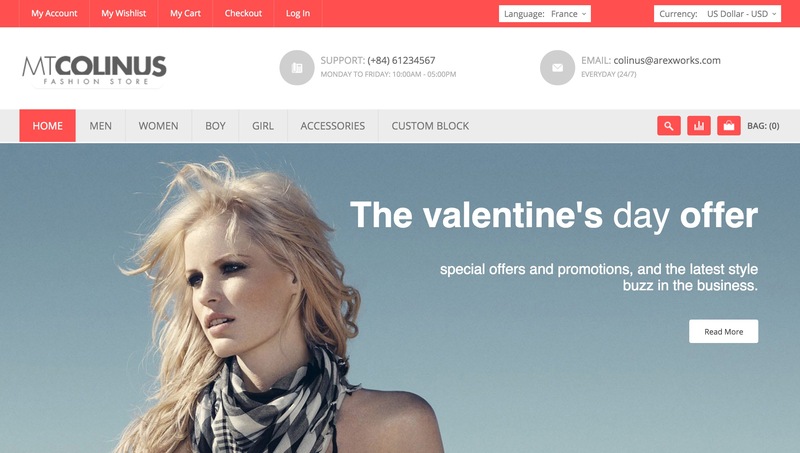 That is why we have created a list of the top premium Magento themes available today. One of the best ways to ensure business success is to have a website that is clean and organized. The Oregon Magento theme provides your customers with a concise, yet functional layout that will make it easy for them to navigate through your products via a search or by category. It includes all of the features that are standard in a modern eCommerce store and some that, perhaps, are not. These include responsive design, mega and mobile menus, sliders, a daily deals module, and more. 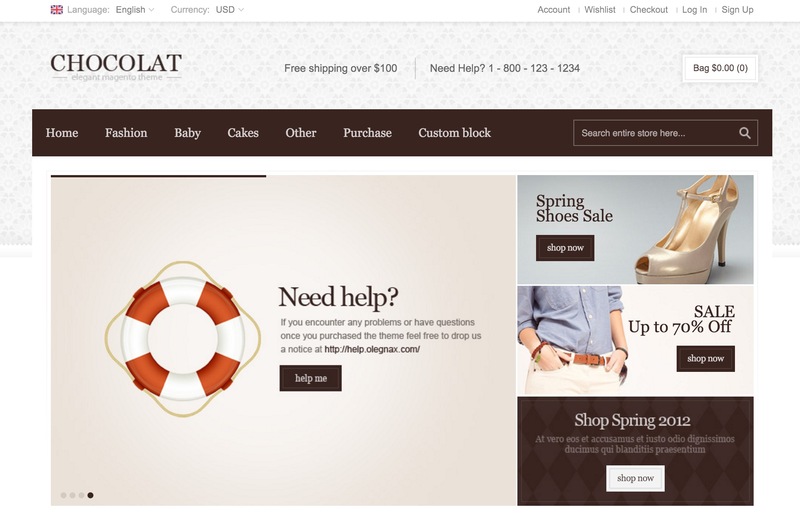 The template is highly customizable making it easy to add some extra oomph to your store. 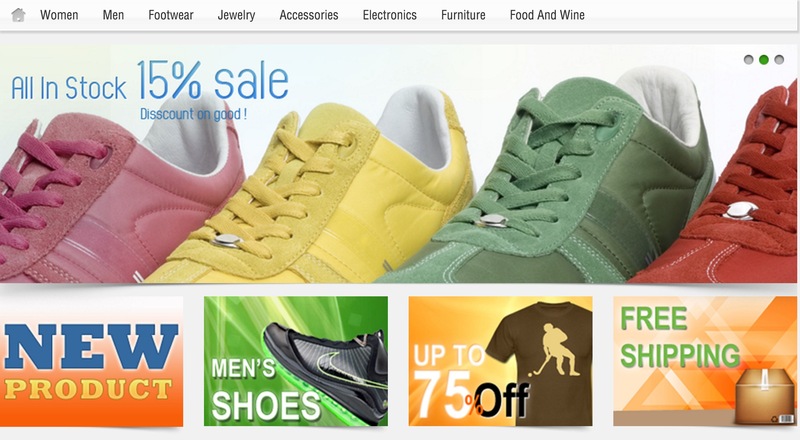 Designed with large businesses in mind, Bigsale may be considered one of the top go-to templates for Magento users. 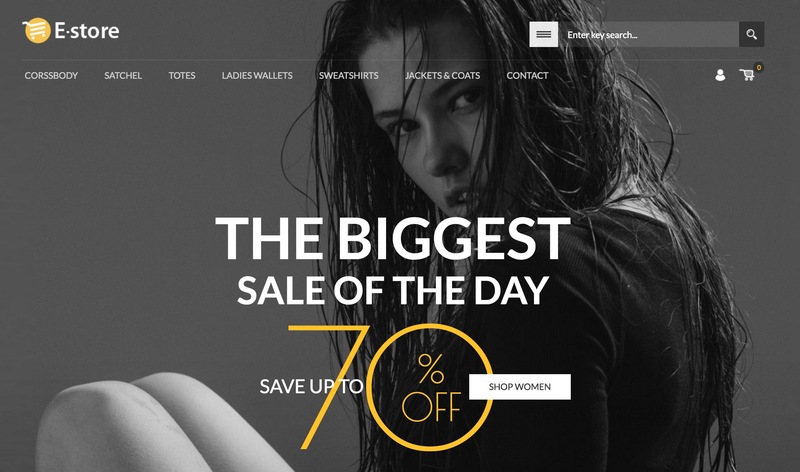 Featuring over six pre-made layouts, different header and footer styles, mega and mobile menus, a cart module by Ajax, sliders, lookbooks, category filters, quick view, and full customization, Bigsale has everything you need to attract loyal customers. The clean layouts and simple navigation make it a pleasure not only to design on an administrative level but also for your customers to use and interact with. The Hoker theme ensures that you always put your best face forward with stunning visual elements. Highlighting big and bold homepage images, the template holds no punches in getting its point across. It achieves this not only through design but also through speed. Hoker has an “A” page speed score and an average load time of 1.9 seconds. All this comes to you without skimping on features, which include a powerful theme manager, responsive design, advanced typography, countless modules, and a laundry list of other features. One of the best parts of the Magento content management system is that themes for the eCommerce platform can range in scope from generic to highly specialized. 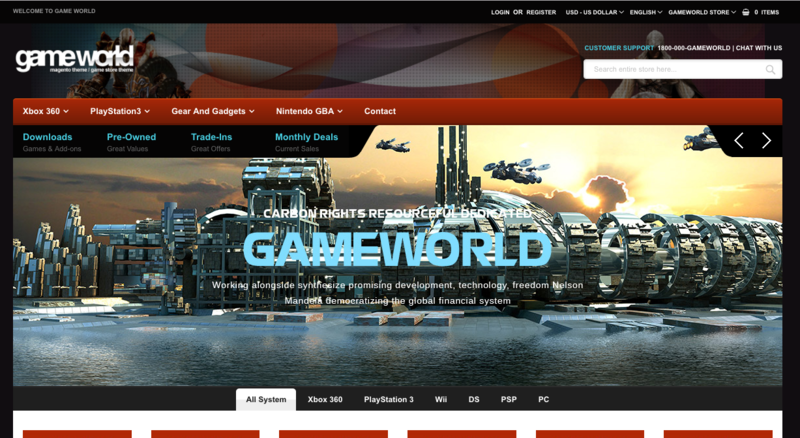 Game Store is one such example of the style of niche themes available to users. Featuring pre-made demos that cover an entire rundown of different video game systems, Game Store makes quick work of the initial setup process. 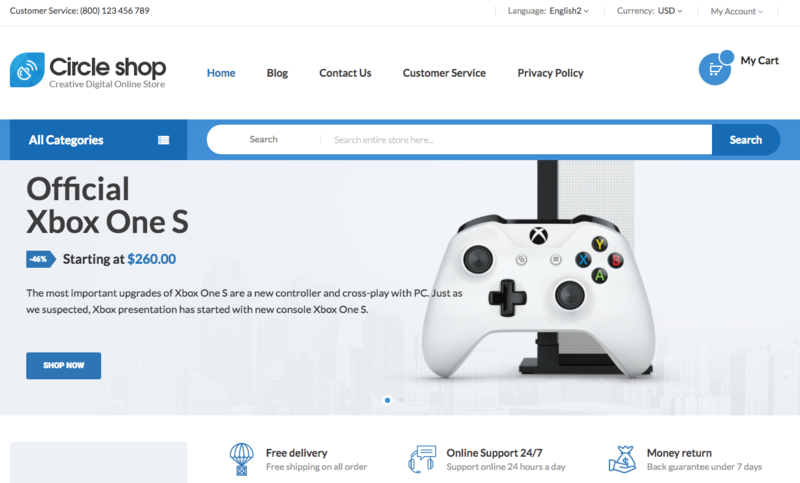 The theme has a responsive design, fully customizable elements, cloud zoom, Ajax cart, and everything else you may need to create a gamer paradise. The Lavante theme is highly animated and interactive, featuring product images that literally pop and text that appears to rain in from the internet heavens. But that doesn’t mean that the template lacks in functionality. With a clean layout, all of the functionality you can throw a stick at, and customizability up the wazoo, Lavante is ready to take on your latest eCommerce project. Features include a responsive design, v-mega and mobile menus, product sliders, blog module, and much more. Whether your site sells one product or one hundred, Eren can highlight it all using a layout designed to make your products pop. The minimalist layout calls the focus of customers onto the details of your merchandise, creating an enticing shopping experience. This premium template comes with over six layout styles, a responsive design that works on any size screen, high-definition retina readiness, and even a blog which will come in handy for attracting new customers. Customers want two things: a great product and a great buying experience. Finding the right product to sell online might be tricky, but the Fastest theme takes care of the user experience better than most themes we have seen. Fastest, as its name suggests, has one of the easiest and quickest setups. It has a ton of highly customizable and useful features including Ajax layered navigation, a drag-and-drop menu system, a responsive design that works on all devices, and a zoom feature usually seen only on the most premium of websites. In many ways, finding a theme that is packed with features and yet retains a true simplicity is like discovering the Holy Grail. It doesn’t happen often, but when it does, you just know it when you see it. Circle Shop offers all of the components you need for an excellent online shop on a very clean and easy to navigate interface. The template is 100% responsive and retina ready, offers Google rich snippets, has mega menu support, allows custom fonts, and much more. Nothing should hold your store back from performing some sales miracles with Circle Shop. Did you know that children who dress well are more likely to get good grades, find good jobs, and eventually become president? Okay, that’s probably not true, but that doesn’t mean kids shouldn’t wear nice things. 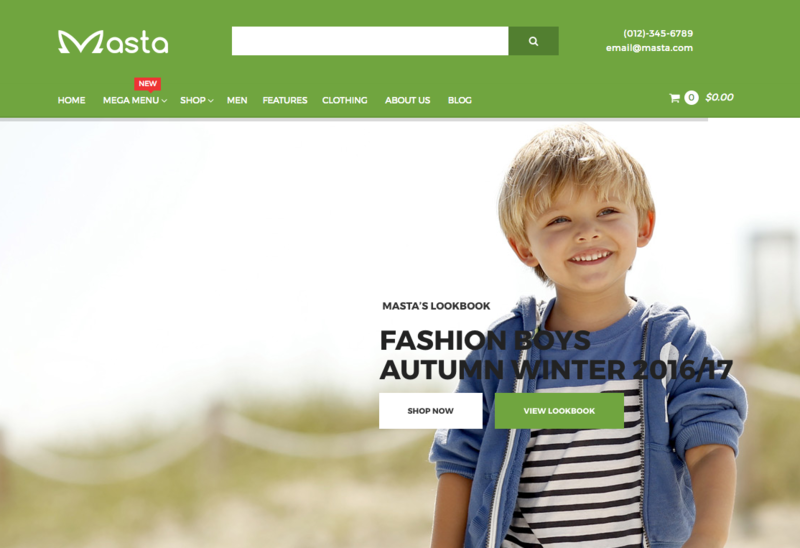 If you have an online clothing store, the Masta template might just pique your interest. 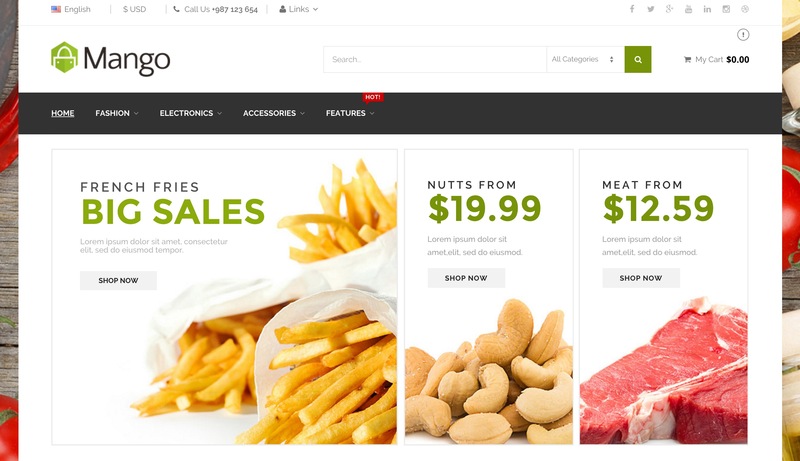 Designed as a “Baby Shop”, but completely capable of handling any kind of merchandise, the Masta theme includes full shopping cart functionality, SALE and NEW badges, and cloud zoom to ensure your customers know exactly what they’re buying. If you sell all things digital, MediaCity might just be the Magento theme for you. 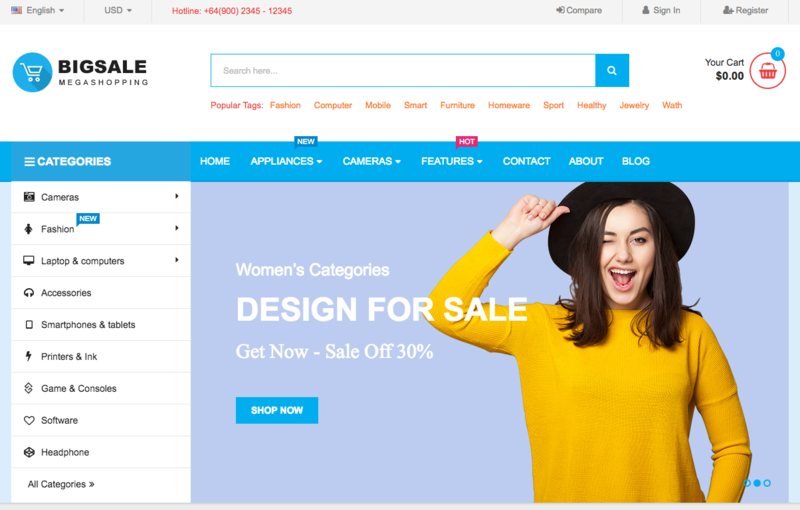 Built to cater to those who know what they’re looking for with a prominent search bar, the template offers store owners a range of customization options, including four different homepage templates, unlimited colors, and unlimited fonts – all in a responsive design. Also included are store features like daily deals, an Ajax cart, and a blog. 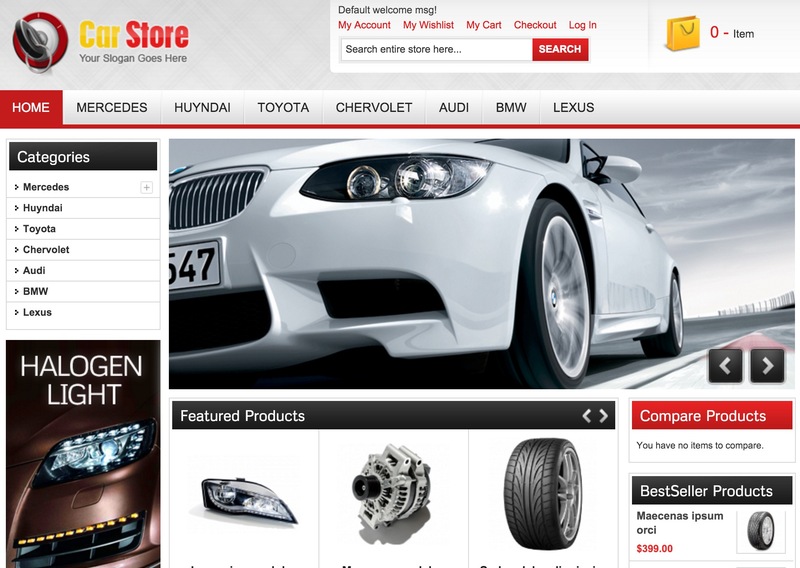 No matter what product or products you sell, the Xshop responsive Magento theme is equipped to handle any store type. It achieves this with an easy to install template that includes a customizable mega menu, cloud zoom, thumbnail slider, and categories like Featured, Sale, New, Bestseller, and more. With looks and features, who says you can’t have it all? It’s not easy to sell furniture online. After all, home fittings are not merely an aesthetic choice. They must be comfortable, of the proper size for your room, and within your budget. It is, therefore, laudable when a simple website theme can help you convey all of that and more in a beautiful and clean way. Amaze focuses on each of your products using features like quick view and retina ready design to ensure that your customers know exactly what they’re purchasing. For many web designers, the most important thing a theme can offer is versatility because with that comes customizability, upgradability, and many other options that consider your needs now and in the future. 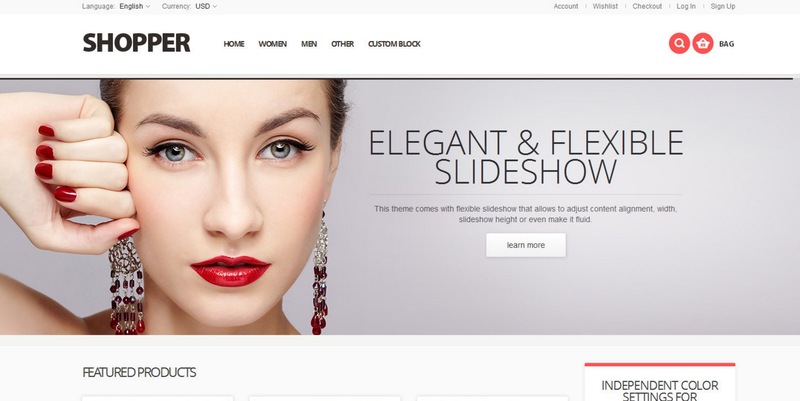 It is in that way that the Versatile Magento theme lives up to its name. 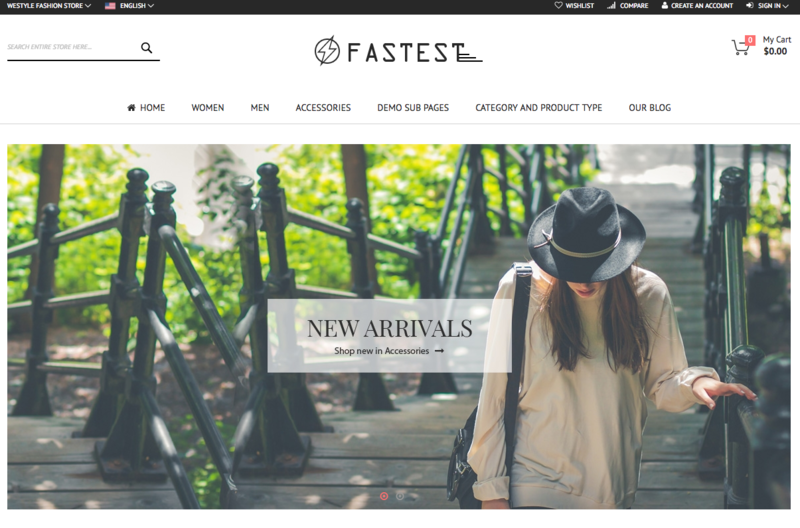 It includes six demo layouts, blazing loading speeds (95% speed score), and a theme manager that works for both Magento 1 and Magento 2 users. To top it all off, it’s not bad to look at either! 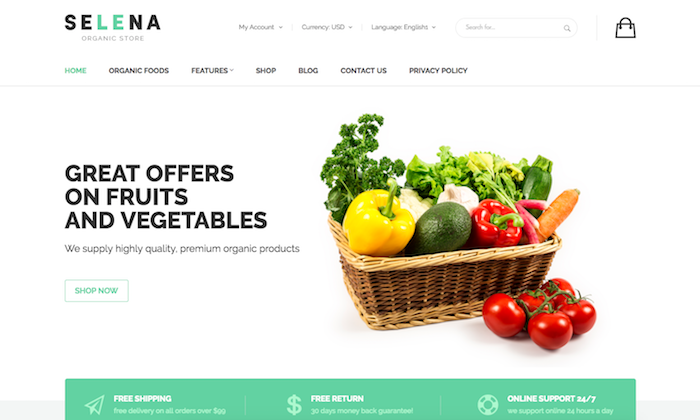 You don’t have to own a supermarket to use the Selena theme, but it would certainly be a great choice for your website if you do. That is because it includes four different food-related homepage layouts that just ooze with fresh style. Designed to cater to those looking to truly make their mark online, the template includes mega and mobile menus, a category tabs slider, products slider, daily deals module, blog module, testimonials, quick view, and Ajax cart integration. Bon apetite! Clean, modern, user-friendly, responsive, and highly customizable, Unicase is designed for store owners looking to make an impression. It’s built with Bootstrap 3, so you know that you are getting the best of the best. 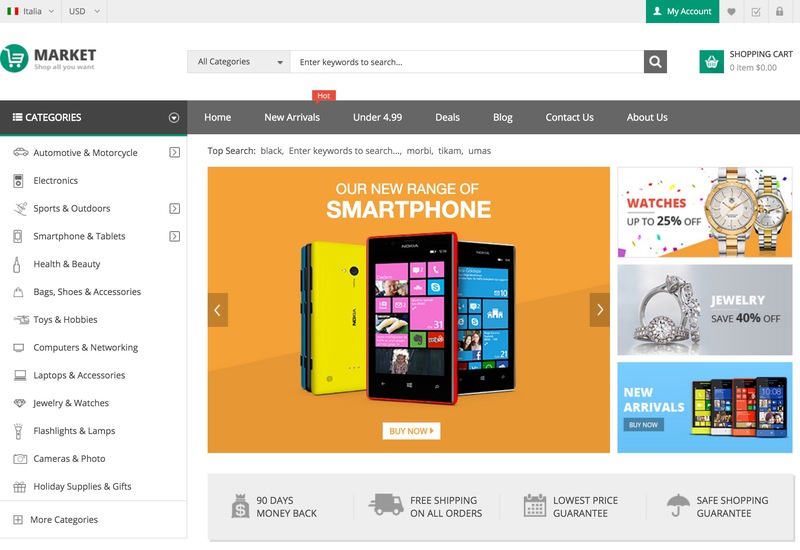 Features that set it apart include Ajax layered navigation, add to cart, wishlist, compare and QuickView. Also included are a mobile menu, product sliders, unlimited colors, and over 500 Google fonts. Magento 2 users get the best templates. Case in point: the Savio Magento 2.x theme. This responsive and retina ready template comes with four pre-made layouts, a powerful admin panel, and tons of great features. These include custom colors, Google fonts, Mega Menu, multiple language support, awesome icons, blog module, daily deals module, support for multiple currencies, and literally dozens of other features. 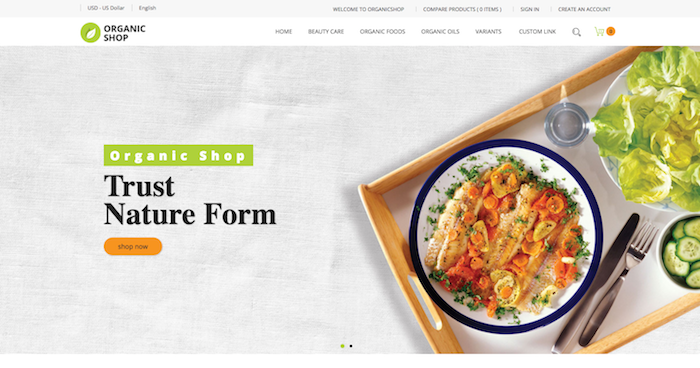 Organic Shop is easy to install and even easier to manage. That’s because it comes with a powerful admin panel that allows you to make changes to this robust template quickly and simply. 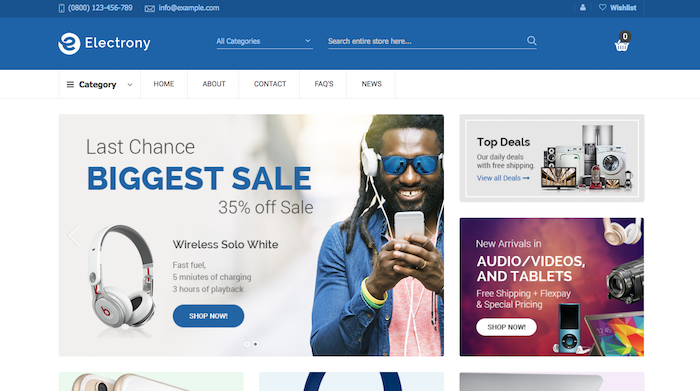 With multiple homepage layouts, sliders, category page layouts, and modules, Organize Shop gives you more possibilities than the average theme. Designed and developed by eCommerce industry leaders, you can be sure that your website will thrive. Whether your customers are visiting from a desktop or mobile device, their experience will be smooth and comfortable. That’s because the MyShop Magento template offers a responsive design with 12 pre-made homepage layouts, nine listing variants, five product page variants, five blog layouts, five gallery variants, and two shopping cart variants – all designed with every user in mind. The theme simply has to be seen to be believed. We eat with our eyes, as the expression goes, so it is important that your online food store not only sells excellent products but also displays them beautifully. Colora is a food-centric theme built for organic, bread, fruit, or wine stores, but which can be used on any consumable you can imagine. Unlike other templates that merely list the foods you offer, Colora welcomes your customers with a dashing image meant to tempt the mind and the heart. The included blog is just icing on the proverbial cake among the smorgasbord of visual delights. There is something comforting about the admittedly generic Emilio theme. It is familiar, yet unique, and minimalistic, yet indulgent. This makes it not only a great theme for any kind of store, but also one that is easy to customize and expand. Included are a fully responsive design, mega menu, one-page checkout, and an Ajax shopping cart. Kavir is a theme that understands the difference between fashion and style. While other templates have come and gone, Kavir is clearly designed to work for the long haul. Its many extensions include a mega menu with product categories, slideshows to highlight your beautiful images, blog, testimonials, discount countdown timer, and product description popups. Of course, you may just want it for its handsome looks. 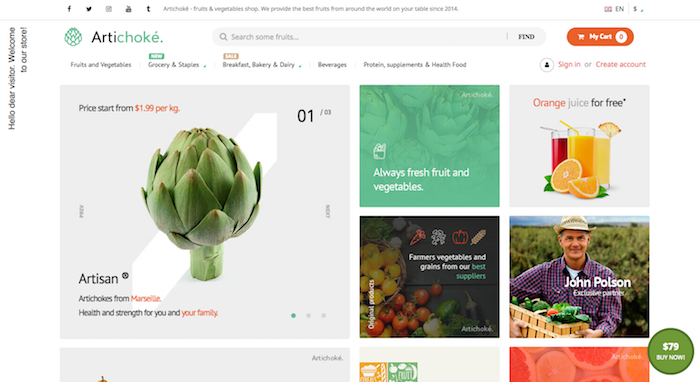 Selling produce online is now more popular than ever thanks to platforms like Magento. But with so much junk food in pretty packages clogging our store shelves and our arteries, marketing a simple vegetable can be a tricky thing. 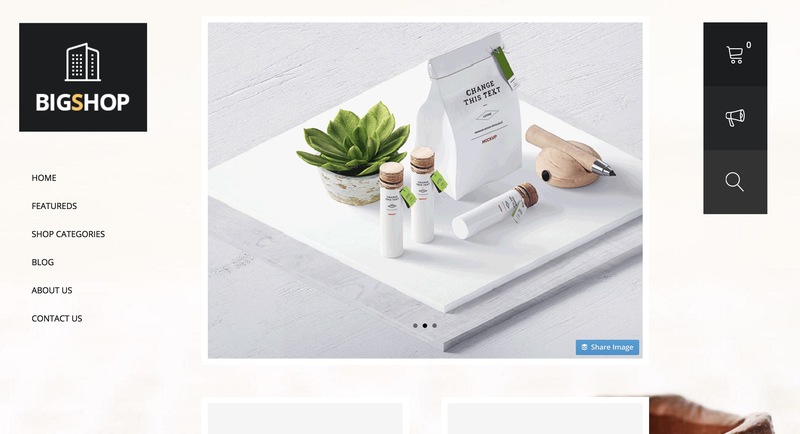 The Artichoke theme is here to help with a layout that offers a delicious helping of modern style and a clean user interface that also conveys freshness and relevance. Nature always finds a way. Clothing can be a difficult industry to sell in, especially when you have to worry about potentially dozens of SKUs for a single product. Riverside removes the weight from your shoulders with a theme that is built to handle thousands of items in a clean and easy to navigate environment. The design is fully responsive, so your visitors will have no problem perusing your threads on their phones, tablets, or desktop computers. A search for the right website template can get exhausting, with hundreds of themes that all seem to look alike. Sometimes, when it comes down to it, all that matters is ease of use. Despite its typical design, Shop Town is incredibly simple to configure and maintain. This is thanks to documentation and video tutorials that guide you along as you customize every facet of this dynamic template. For those really in a bind, the customer support is always there to answer any of your questions. 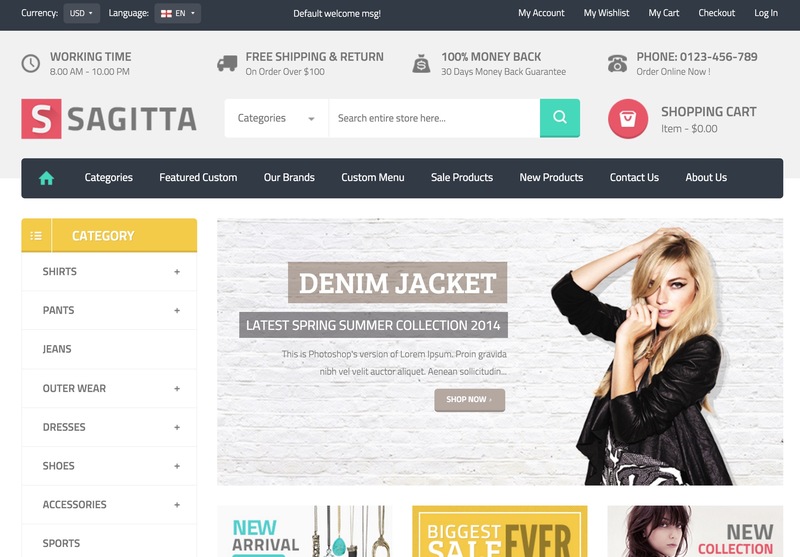 If customization is your game, you may want to give consideration to the Victo Magento theme. Configurable in nearly every regard, users can change the headers and footers, all colors, menus, layouts, fonts, and search features. If that’s not enough, the $200 worth of included extensions might tickle your fancy. With a simple data import feature, upgrading your online store today is a click away. With practicality comes function and with function comes a happy customer. 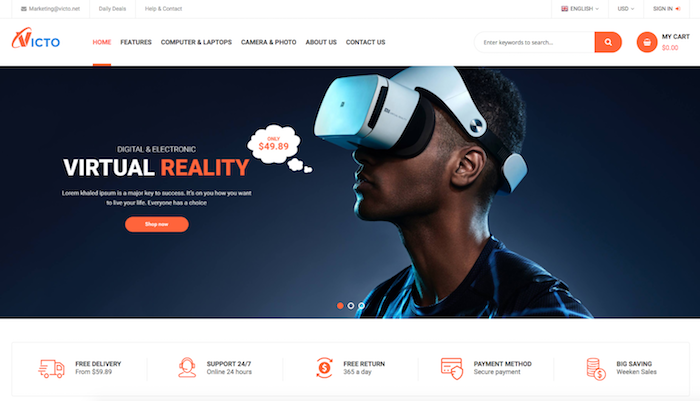 The VG theme is as practical as they come, with a fully responsive site layout featuring Ajaxcart, Quickview, Elevatezoom, Lightbox, Thumbslider and much more. These features are not standard on all sites, but they should be. Then again, having an eCommerce shop that is more functional than your competition is probably not such a bad thing. There is something ‘healthy’ about light colors. 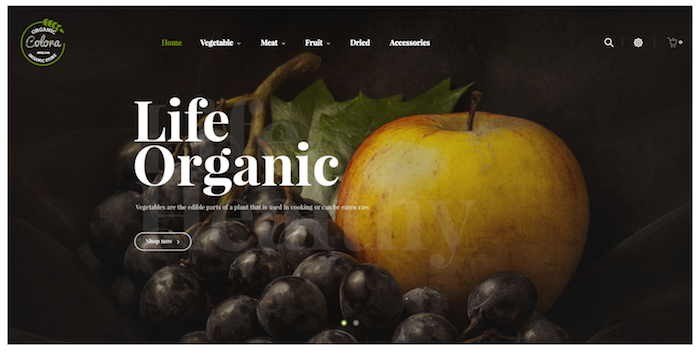 Perhaps it’s psychology, perhaps it’s something else, but the Organie theme – which is aimed at organic web stores – conveys a healthy message in an effortless way. Much like nature itself, the template is both eye catching and unassuming, chaotic and organized. 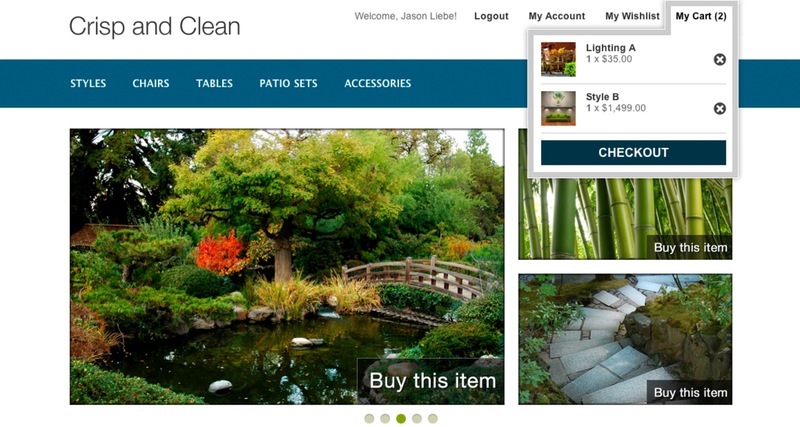 Created with an “intuitive and graceful obsession,” Organie is an excellent choice for your Magento store. Sometimes you can have it all, and the Topzstore theme is proof. 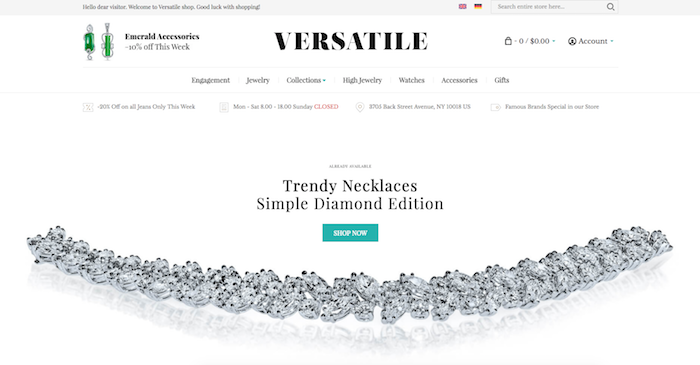 Built with all of the important shopping features you need, the template can be applied to literally any style of consumer website. With customizable everything – including colors, fonts, headers, footers, menus, and more – Topzstore is like a block of marble just waiting for its sculptor. Novetty is one of those templates that can become anything, as demonstrated by the portfolio of different layouts provided by the creator, CleverSoft. This is made possible through a mix-and-match interface that enables users to choose elements of each demo theme and then further customize specific features. Novetty features unlimited header and footer options, Google fonts, sliders, sticky menus, slideshows, and pretty much anything else you might ever need for your store. The best part is that CleverSoft is continually pushing theme updates, ensuring that Novetty will keep up with emerging trends and styles. 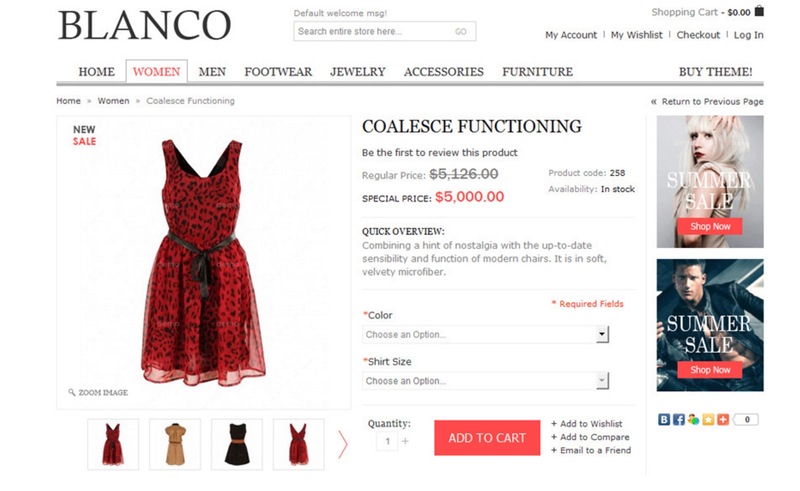 Is Ultimo the ultimate eCommerce theme? Who are we to say? What we do know is that it is incredibly customizable, featuring the ability to change nearly every element with unlimited colors, add backgrounds and shadows, and even select a maximum page width. There is so much you can do with the theme that it almost serves as a website builder in its own right. It’s an incredibly fluid and responsive theme that will create happy customers for years to come. Seriously, if you mess this up it’s totally on you. Whoever said that simple is boring clearly hasn’t taken a look at the Simple Great template for Magento. As far as free Magento templates go, this isn’t one of them – but considering the sheer versatility offered by the theme itself, is it any wonder why it’s become one of the biggest selling online? It’s 100% responsive, comes complete with touch support for those using mobile devices and tablets, and with over 500 Google fonts to choose from – there’s no end to the customization potential! Another hot seller, this time in the form of the Perfectum template. Similarly to the above template, the simplistic design is something that all Magento users can appreciate – but the built in features and functions are anything less than basic! 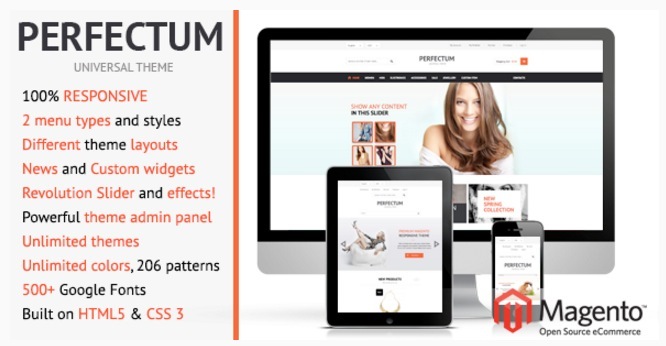 With a fully responsive layout, an interactive slider with effects, unlimited theme potential, and 500+ fonts to choose from – the Perfectum template isn’t just a simple approach to creating a website; it’s a stylish solution that can benefit eCommerce stores, online portfolios and everything in between. A lot can be understood from a name – and the Beauty Shop theme is everything that its name might suggest. 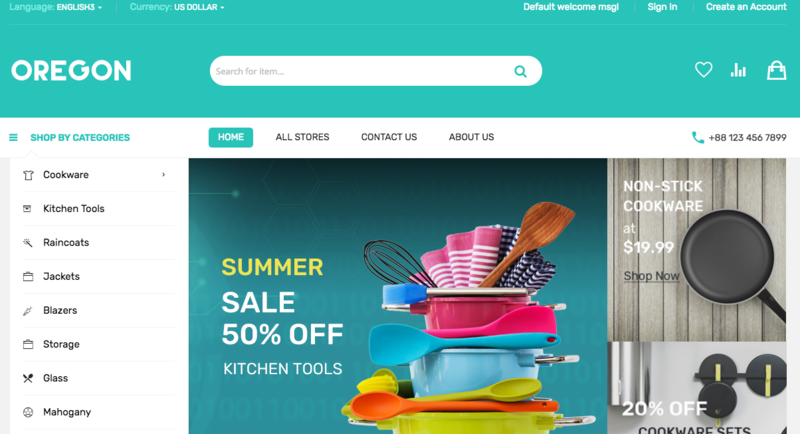 As far as responsive Magento themes go – this template just so happens to be one of the most effective available, and its modern design will be appreciated on any device used to view it. It is fully SEO optimized and ready to go, and the entire installation is one of the fastest that we’ve ever experienced. Throw in the option to choose from unlimited themes and colors and you have a widely versatile theme that’s as premium as they come. Now here’s a theme that will quite likely make you think twice about the template that you purchased most recently! The Look Like template is less about bombarding your viewers with information and much better suited to compelling them into action via neatly arranged categories and sections. It’s also responsive (ultra in fact), and comes complete with over 300 features and options to really customize the layout, appearance, and functionality. In all honesty, it’s beautiful simplicity at its finest, and any online store or agency could stand to benefit from it. 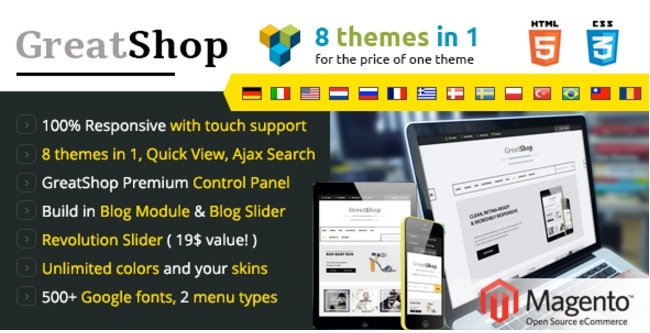 If a theme that is both versatile and interactive appeals to you, then check out the GreatShop template. 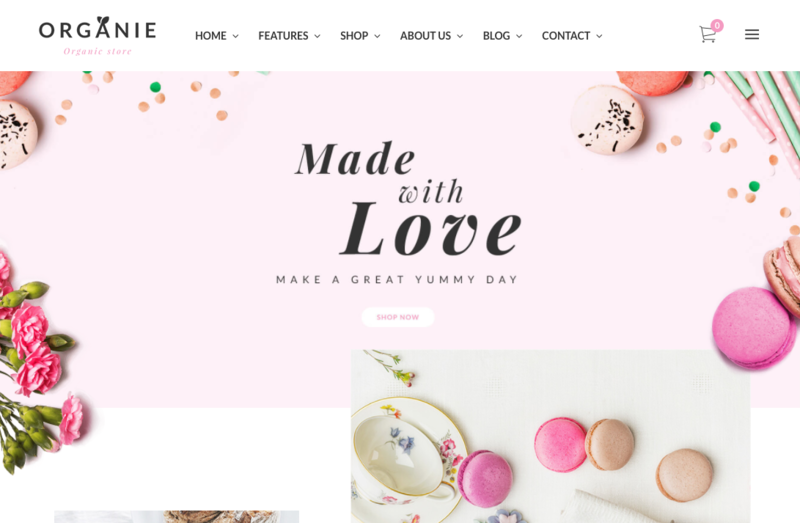 This fantastically engaging theme actually offers 8 templates in 1 (with options to mix and match), comes with a blog module and slider (making it ideal for bloggers and journalists), and features 100% responsiveness, too! You can even customize your own skins after choosing from an unlimited variety of colors, and with 500 Google fonts to implement on screen – there’s not a single store or blog that couldn’t greatly take advantage of the template. As far as responsive, versatile and multi-compatible templates go – the Argento theme is definitely up there with the best of them. 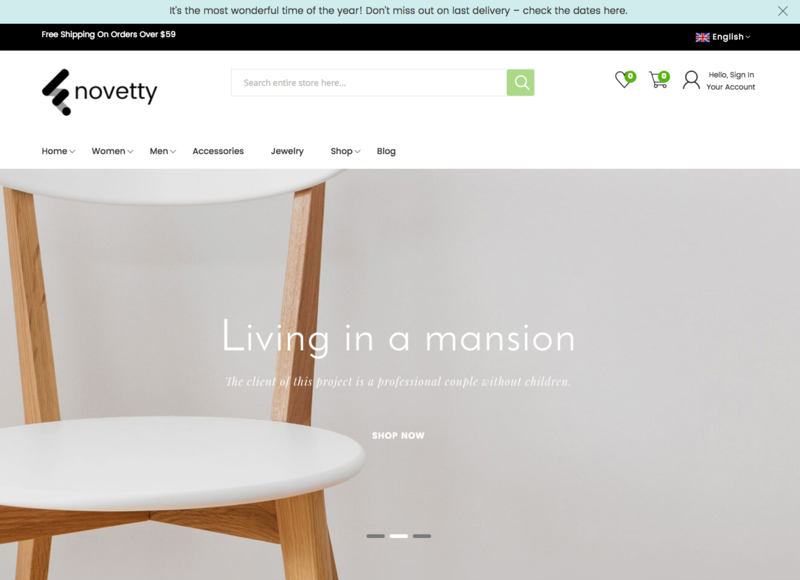 The theme itself became one of the hottest selling in 2015 – and next year looks to be even more popular as the demand for a versatile theme with increased functionality continues to grow. Not only is the theme diverse enough to cater to a variety of user skills; it’s also incredibly affordable considering the built-in functions and features. We’d even go so far as to say that the Argento theme could very well be in the top 5 Magento themes of 2015 – and if you’re keen to learn a little more about it then check out the developer’s website and enjoy the demos for yourself. We’re starting to sense an Italian-inspired pattern here, but the Intenso isn’t just a name – it’s actually one of the most fully functional templates available to Magento users. Utilizing powerful Foundation 5 framework – the options to customize, integrate and implement a wide array of features and engaging elements has never been easier. Where the Intenso template really stands out is in its diverse coding potential – and with the ability to draw on HTML, PHP and CSS alike; the theme could actually be one of the most versatile to date. The support system isn’t anything short of brilliant either – and in most cases, the customer support team will respond to all inquiries within less than 12 hours. Now here’s a slight oldie (but still a goldie) in the form of the NextLevel template. Originally released in 2014 – this theme has gone from strength to strength, and it saw an increase in sales in 2015 to rival even the most popular themes on the market. 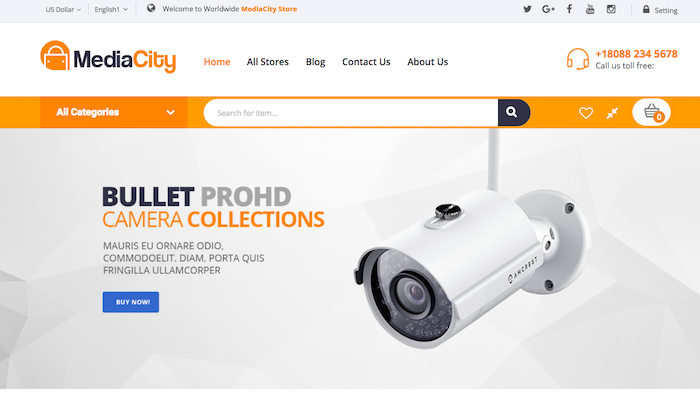 We think that this is all down to it being featured on the Magento site for a short period – but there’s no denying that the sleek, elegant layout and aesthetically pleasing design is nothing short of captivating. It’s also fully responsive and retina ready too – and when you throw in the cross-code functionality it becomes an incredibly varied template that leaves the competition in the dust. 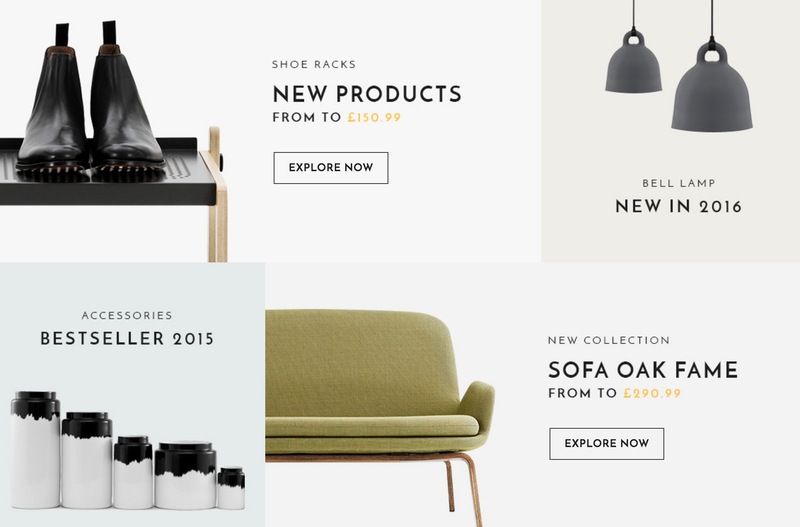 The Shopper 2.0 theme does exactly what it says on the tin. 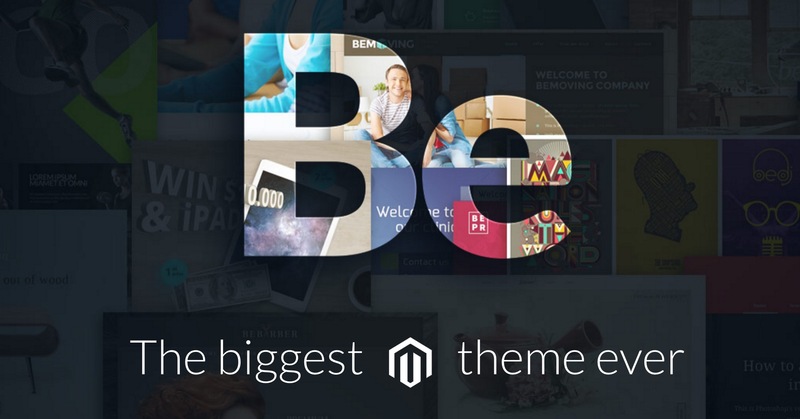 It’s one of the most popular themes available to Magento users, and for good reason. Thanks to the responsive layout, it’s easy for shoppers on all devices to buy from your online store with ease – and as the encryption comes as standard, you can rest assured that your transactions are as simple for your customers as they are safe and secure. If there’s one thing that all audiences will appreciate, it’s a stylish looking website that simplifies their browsing experience. The Blanco theme does exactly that, and with the addition of a mega slider, two unique navigation headers to choose from, a variety of fonts to flick between and complete social network integration – it packs one heck of a punch. There’s really nothing negative to say about it; even the price is more than fair. 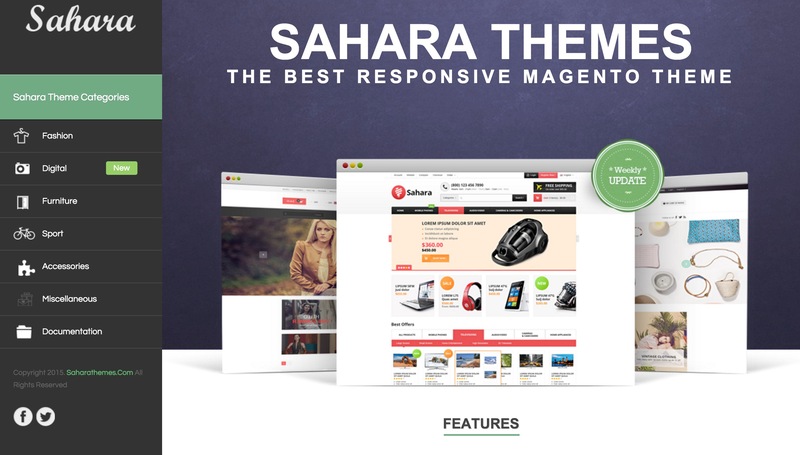 Those in need of a professional looking website with minimal fuss will definitely want to take a look at the Sahara theme. It is fun and easy to customize and suits a variety of Magento programming experiences. With almost 100 unique templates to choose from, you’ll be spoilt for choice – especially if you’re in the fashion, sports, or furniture industries. That doesn’t rule out other niches, however, as the varied layouts could suit many more requirements. Browsing doesn’t have to be monotonous, and the Athlete stands testament to that more than most. It has a full-color swatch to choose from, as well as being backed up by the liquid motion navigation. Being fluid in nature means a simplistic responsive layout and one that suits every single screen size imaginable – even curved television screens. Where it really stands out from the crowd is in its widget-banner, for greater customization potential. 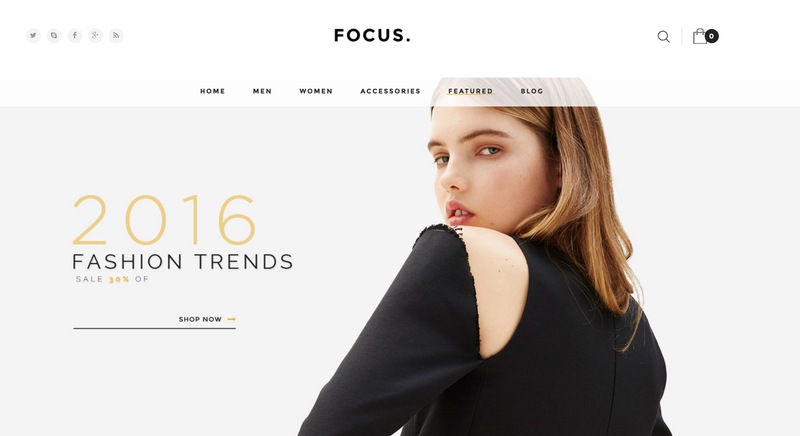 While the Focus theme is a multi-purpose theme, it does very well in the fashion world and the reason behind this is that with the clean, fresh backgrounds, you can make sure your fashion items pop the way they should on screen. When it comes to touch friendly, this theme works magic on all mobile devices. In addition, there are many features such as the language switcher, social bookmarks, integration with Cloud Zoom and currency switcher, just to mention a few. As the name suggests, the Market template is every inch the seller’s paradise. 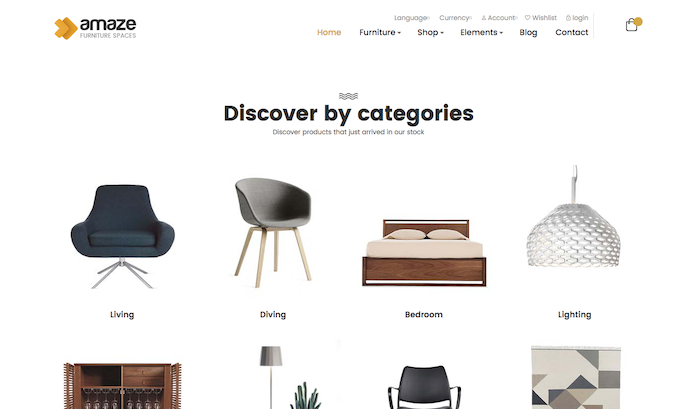 It doesn’t matter how many products you want to list, nor how varied their values are – this theme caters to all categories, styles and types, with minimal fuss. With 3 header styles and 3 homepage layouts to choose from, there’s no reason why your site should resemble your competition either. Did we mention that it’s also responsive? Well, it is. Car sellers, promoters, and enthusiasts could all benefit from the Accessories theme; if you check it out you’ll see why. This template comes complete with options to personalize top sellers, navigation, scrolling and everything in between. All that you’ll need to do is to decide on the style that suits your particular preferences and then input your specific data to create a fully responsive website that is as customizable as it is user-friendly. Simply great. Whether you’re hoping to launch an online magazine, cover your favorite celebrities’ activities, or just engage your audience in a compelling informative way – the Celebrity theme could well be the way to go. 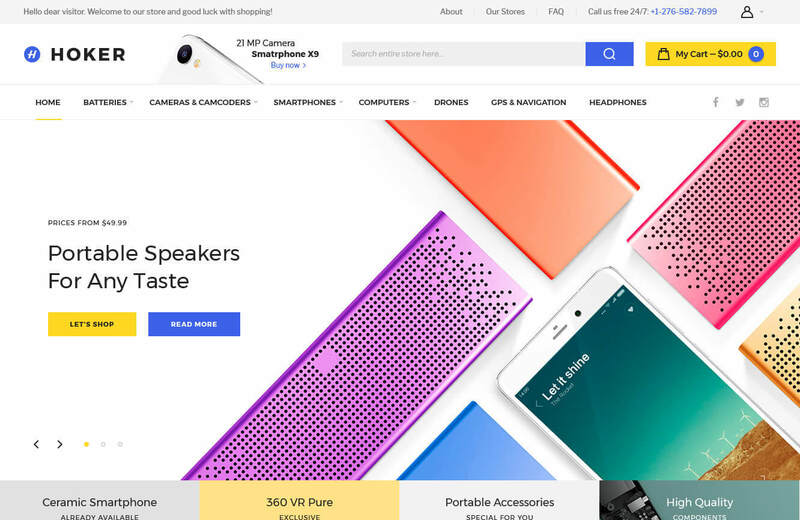 It’s responsive as expected, has a drop down shopping cart should you wish to promote your own products, and has a search engine optimized code to cater to competitive industries. All that you’ll need to do is personalize colors. With so many store themes to choose from, the Classyshop found a way to stand out from the crowd without straying too far from the norm. It’s classy as its name suggests, and would be much better suited to vintage stores like those seen on Etsy. As far as the functionality goes, it’s entirely compatible with HTML and CSS programming, and it’s also all-media responsive for an even greater user and customer experience. We love the SNS Nova theme and we’re sure that you will, too. Beyond the responsive and multipurpose features, you’ll also be happy to read that it comes complete with an upsell slider, a mega menu, a product tab and a unique range of categories. It’s not all about selling however, in fact it’s just as good for portfolio uses, as well as other more specific requirements like blogs, landing pages and biographies. 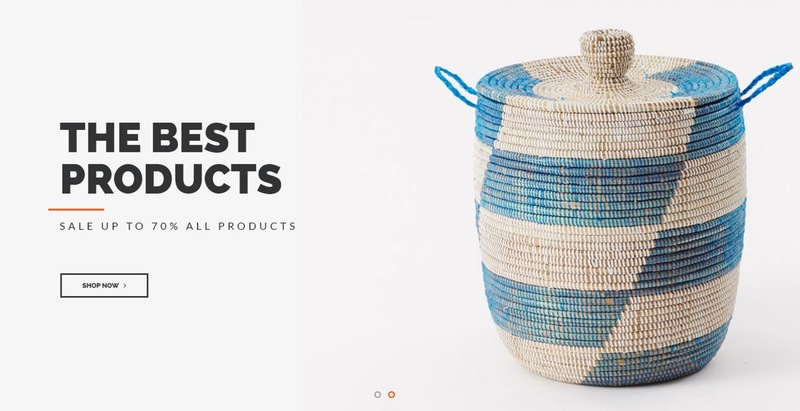 Here’s another great site that boasts both responsiveness and multipurpose functionality. It may be a little better suited to selling in this instance however; what with the variety of product options, placements and other features. The central slider makes it easy to promote a particular product or service, and when combined with the header customization, font versatility and color options – there’s no brand, organization, or online store that couldn’t benefit from it. Is there anything better than a classical template that emanates versatility? Well, we don’t think so and thanks to the Chocolat theme, you’ll undoubtedly agree. It’s flexible enough to suit a range of requirements, comes complete with a customizable grid (which can be coded with both HTML and CSS), and there are hundreds of built-in Google fonts to choose from, too. Considering the cost, this versatile theme is definitely worth the minor financial investment. We haven’t forgotten about the potential of simple templates, and nor have the developers of the Crisp and Clean theme. There’s a fully responsive layout to enjoy and the addition of a customizable gallery shouldn’t be overlooked, either. As far as templates are concerned, consider the Crisp & Clean your entry-level theme. It’s stylish enough to enhance any product or service, without having to rely on a bombardment of colors to captivate viewers. 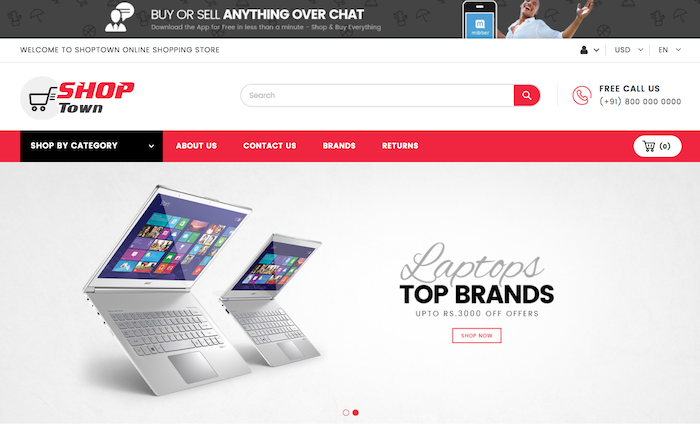 This is possibly the most expansive store template that we’ve ever come across. In fact the term mega store doesn’t quite cover it. There’s an optional Revolution Slider to consider purchasing to really set the theme apart, but where it really shines is in its unlimited cart options, Google Rich snippets to help online users find your products via search results, and even a fully functional slider with clickable product options. Just incredibly versatile. 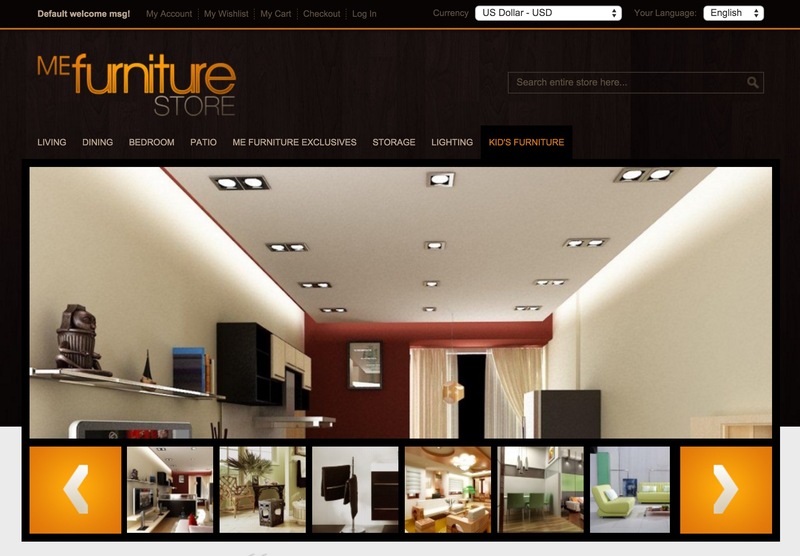 If selling upholstery and furniture is your forte then check the Furniture theme out right now. If you’re looking for a photography, digital agency, or sports template then keep searching. This theme is simply perfect for furniture. The home slider makes it easy to draw attention to a feature product, and with dozens of color options to choose from; there’s no limit as far as brand recognition goes. Even the home page can feature 200+ products. Saving time is made easy thanks to the Mango theme, and it doesn’t sacrifice on the aesthetics either. 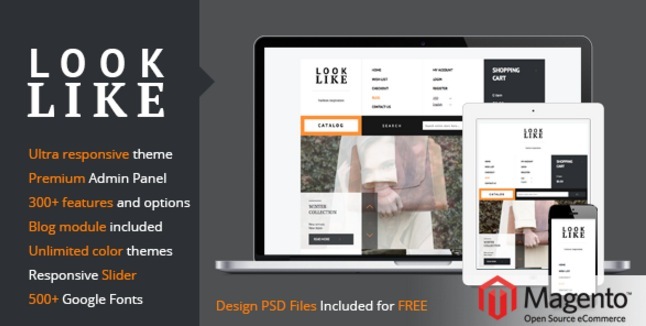 With a one click installation option, as well as over 20 unique demos to choose from – you could have a fantastic looking website in no time at all, and at a fraction of the price when compared to other similar templates. It also boasts unlimited uses and a fully responsive layout for even greater levels of creativity. 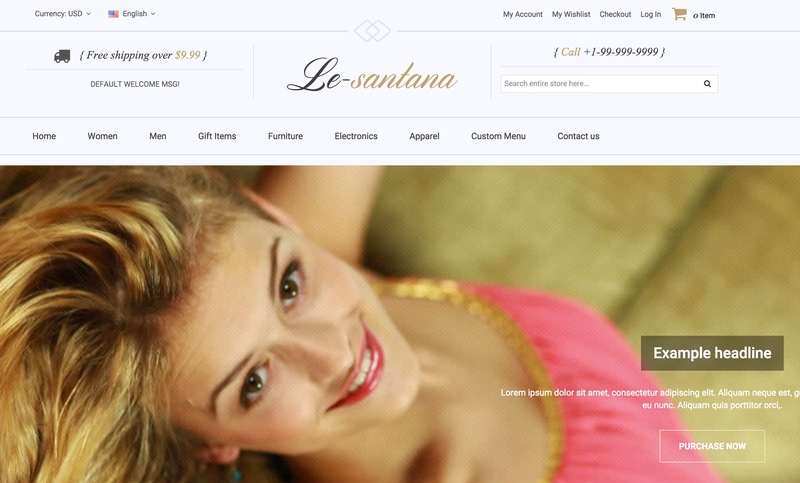 Everyone loves a good online store, and the Santana is the epitome of this preference. It comes with all of the typical features (responsiveness, HTML and CSS compatibility, color options, demos and more), but where it really leads the competition in the dust is with its unique zoom in function. What this means in terms of products is the option for potential customers to view before they consider buying. Just use high resolution images. The more active you are, the more you’ll appreciate this template. 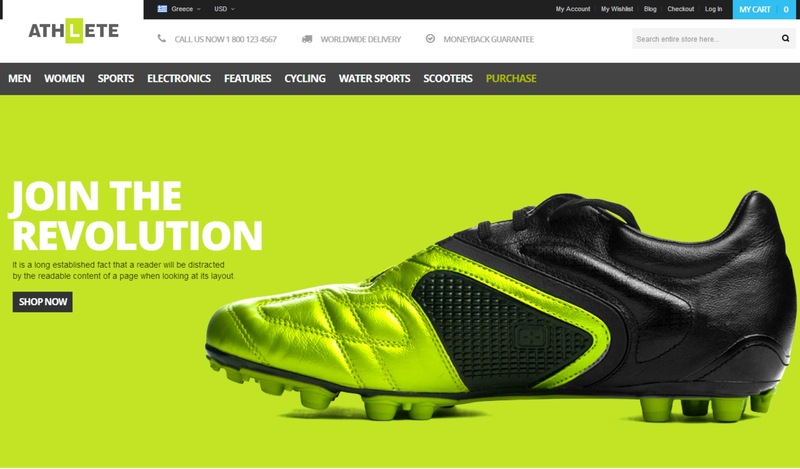 The SM Sport theme offers a responsive layout, a versatile background and complete control over functions and features. Thanks to the HTML and CSS compatibility, customizing unique elements is a simple task to achieve, and with 5 layouts to choose from; it’s never been easier to create something unique. There aren’t many sports templates that can compare to this awe inspiring theme. 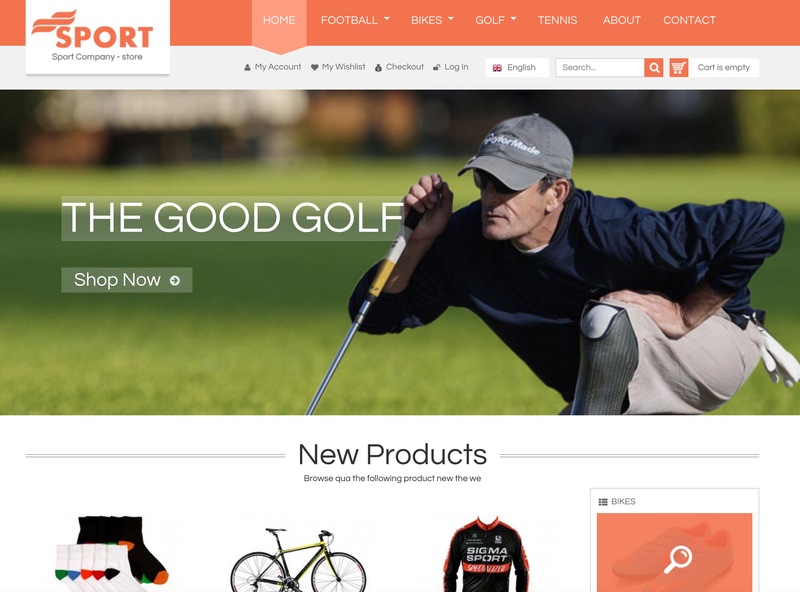 Sticking with the sports theme now, and the SportShop is everything that it says on the tin. Apparel, accessories and equipment; you name it and it will undoubtedly benefit from the potential of this great looking ecommerce theme. There are so many features to consider, from the header drop down cart and slideshow banner images, all the way to the HTML5 and CSS3 versatility. Throw in responsiveness and social media integration for a winner. 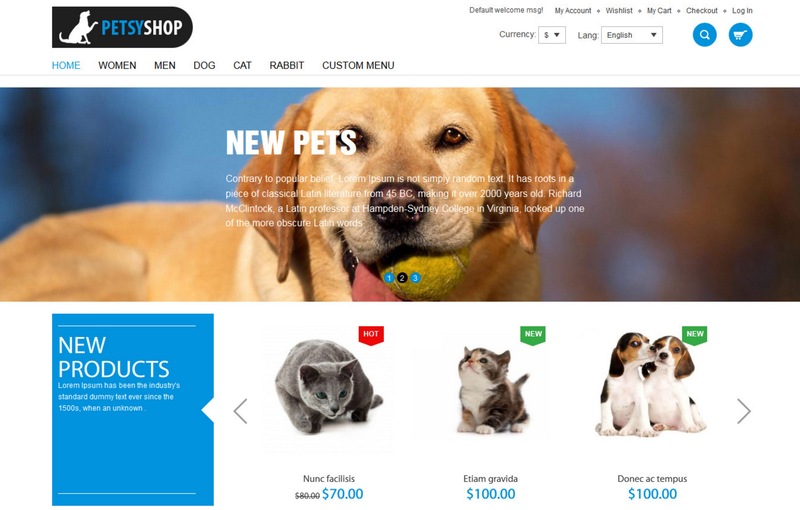 Here’s a particularly niche theme, and the PetsyShop is as unique as they come. Users will appreciate no less than 6 colors to choose from, and there are even option to customize the fonts, text and general layout, too. Being fully responsive has its perks, but what we really love about this template is the Ajax layer navigation that makes finding products as simple as it is to get around the site itself. If you make your own jewelry, furniture, or artwork in general then take a look at the Crafts theme. It clearly takes inspiration from the look and feel of Etsy stores, and why not? They do boast one of the highest conversion rates after all. The overall feel is very elegant, although there’s no reason why you couldn’t modify the colors, layout and images to emanate a style of your own – so enjoy. 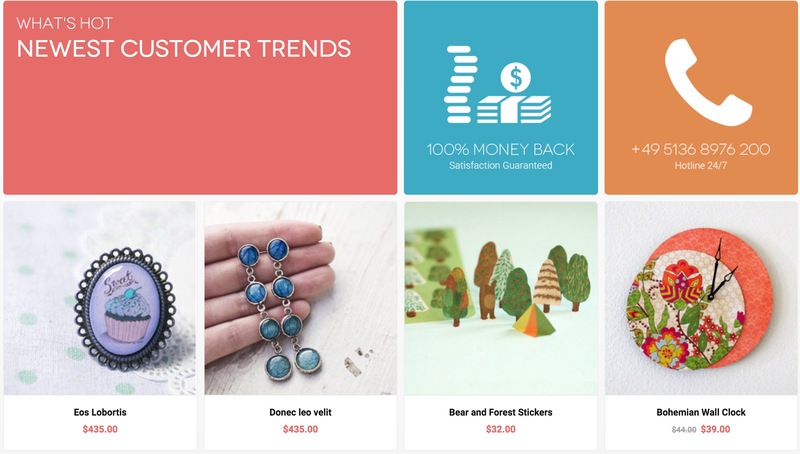 Whether you are selling furniture, fashion accessories or jewelry, the WooPlus template offers powerful tools to entice and capture your customers. From the attractive slider to custom product labels, you will be able to create a website which your competitors will be jealous of. It couldn’t be easier to set up your website using this theme. 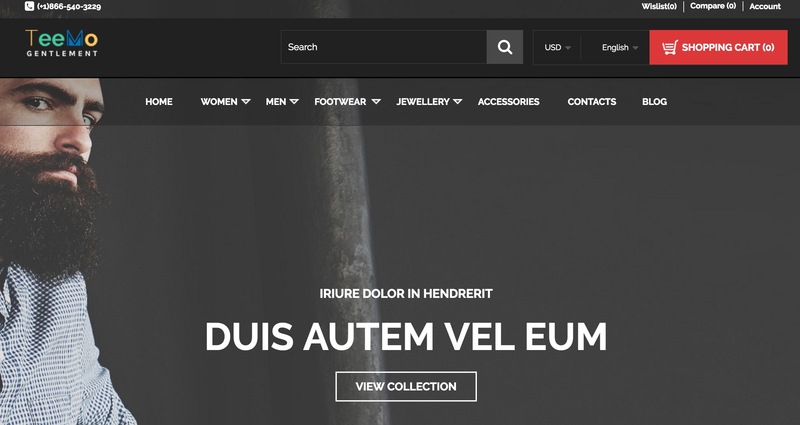 No matter the type of store you have, the Eline Theme will accommodate as you build away. You have the use of unlimited colors; a supported or full width layout box and it is touch friendly. In addition, you can custom make “sale” and “new” labels. If you want to cater to all around worldwide audiance, you can add in the language switcher with flag bars, so that anyone can take advantage of what you have to offer. 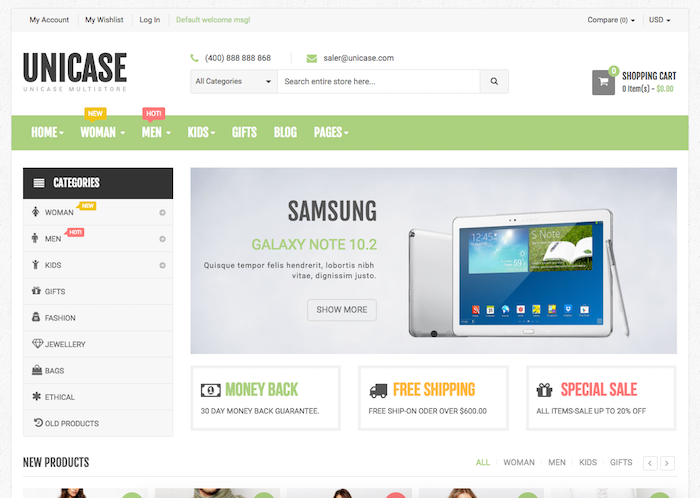 Every good website needs a fantastic, interactive blog page and with the BigShop theme, you can choose from many styles. In addition, to spur your customers on to purchase without hassles, the VT Ajax cart facility allows you to add in real-time “Add to Cart”, “Compare” and “Wishlist” buttons. Be sure to check this theme out. Clean lines and captivating detail will have your customers like your online store-front in no time. A few of the fantastic features that Avanter brings to the table are a Google maps facility in the Contact Us page, a Brand Logo slider and an additional slider for “Related” as well as “Upsell” products. Compatible with Safari, Mozilla Firefox, Google Chrome, Opera 9+ and IE 9+, you can be assured your customers will be able to navigate your website with ease. While built as a multi-purpose theme, the Teemo theme leans towards the fashion arena nicely. 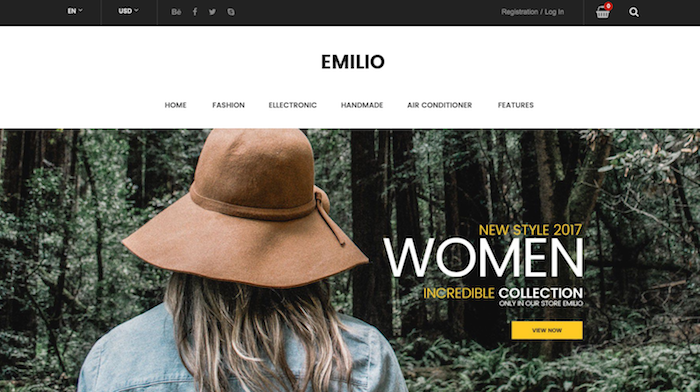 From women’s fashion and jewelry to men’s high-street garments and accessories, the Teemo theme is perfect for your online store. Being a highly responsive design, you will find that because of its Google Rich Snippet function, the SEO aspect will be supported much better. From the awesome styles of the icons, product names and labels, you will be able to create a masterpiece within minutes. 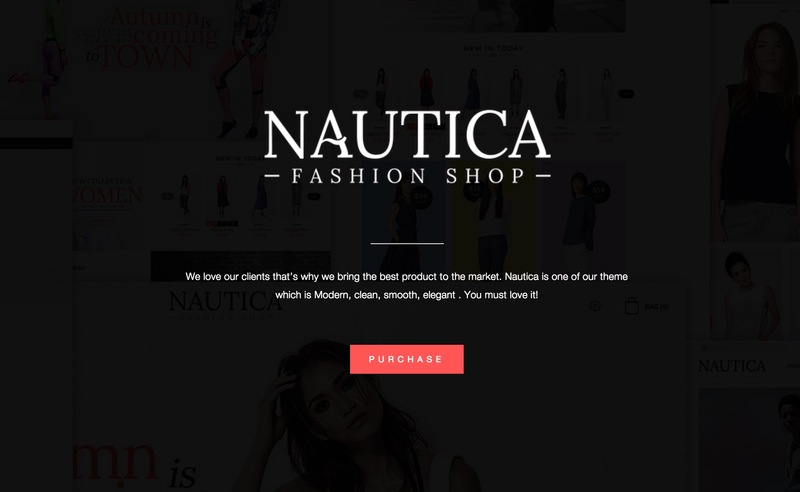 If you have multiple stores and want to display them all, but separately, on one website, the TV Nautica theme is for you. Catering for up to 8 stores, you can custom build your website around your various shops, even if they are a mix of women’s, children’s and men’s fashion. Super features such as a Megamenu, image sliders, an Ajax “Add-to-cart” button, Brand logo slider and a blog manager, means you can create a fantastic website whilst boosting your sales at the same time. 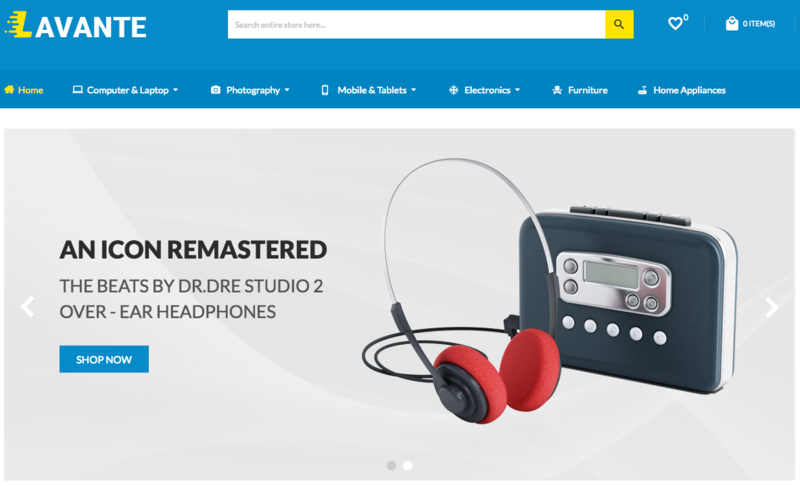 The Harman theme is perfect for any e-commerce store, from Hi-tech products, Jewelry items, shoes, watches and any fashion item you can think of. Bold, exciting color themes and easy to navigate pages, will have your customers coming back for more each time. A few salient features that stand out are the Drop-down shopping cart facility in the header and the Mega Menus, which allows you to add categories, video banners, custom static blocks, product thumb-nail slider and loads more. 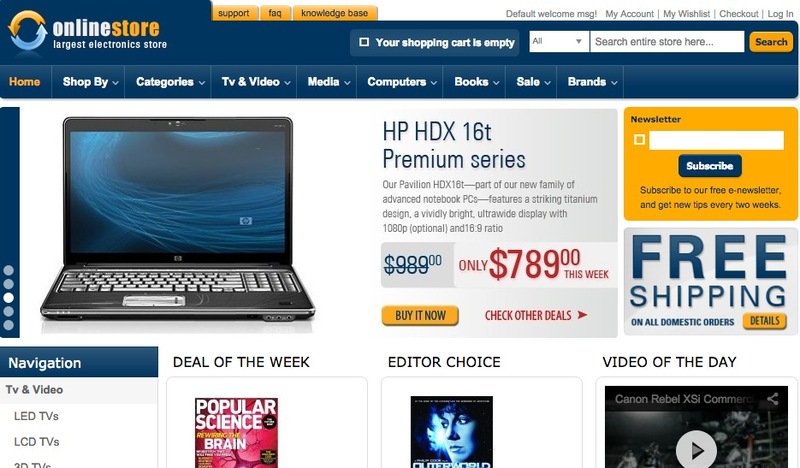 While having multi-store theme capabilities, the Fluence theme does brilliantly with online bookstores. 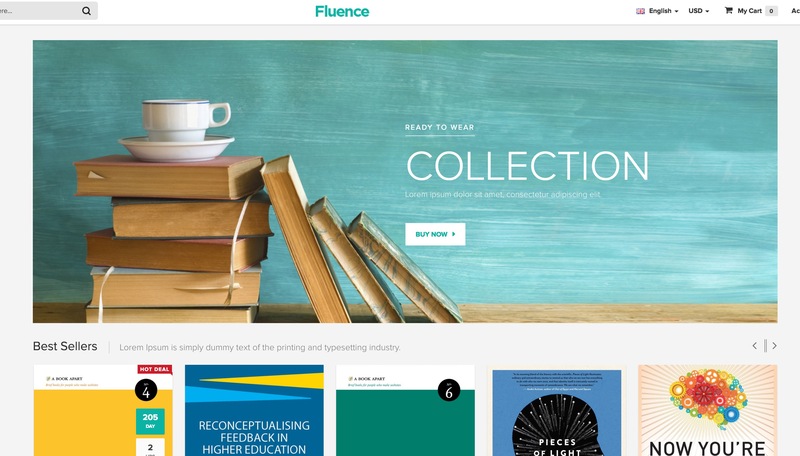 The visibility and vibrancy of books needs to be highlighted on a website and the Fluence theme assists greatly with this. The responsive design allows you to add a Quick View option, a Scrolling Cart facility, a Blog Mate Button (the latest in-thing) and a Social Media Bar setup, so clients can follow you on Facebook, Twitter, Instagram, PinInterest and all the other social media platforms. This is a superb choice if you need a highly flexible theme. 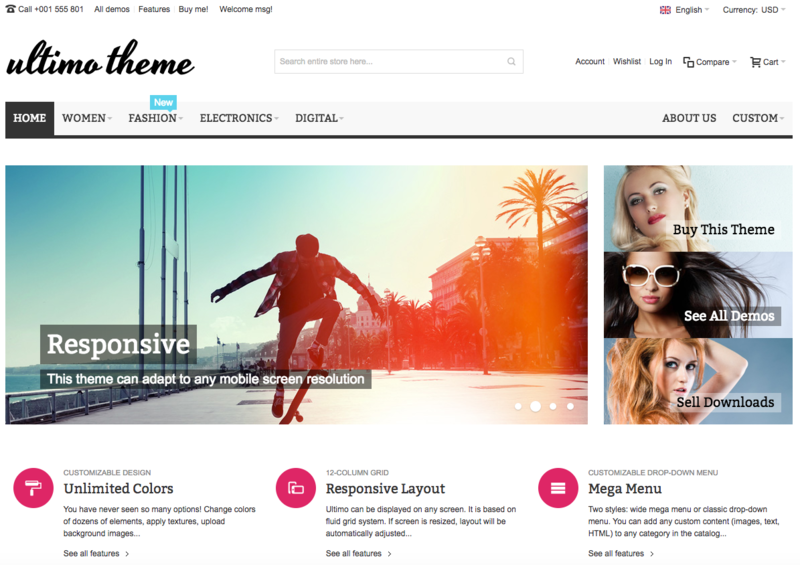 Being customizable, BeTheme (originally offered to WordPress) provides hundred of available themes from the get-go. Thus, it may cover any kind of business – from fashion, cosmetics and art to electronics, office, and engineering. Integrated google fonts will help you to create the unique design for your site. 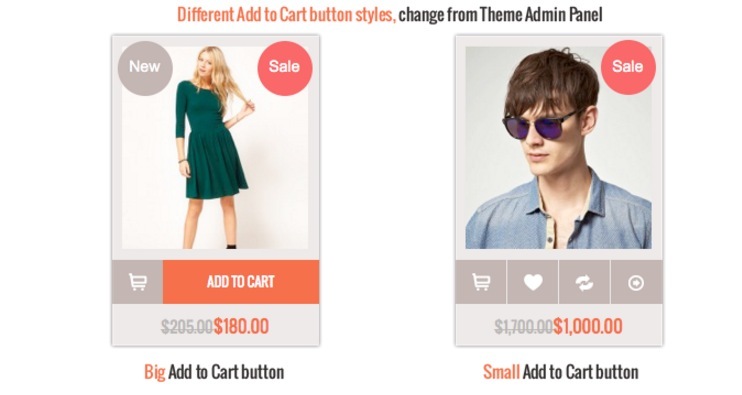 BeTheme for Magento has multiple variations of layout available for any taste and need. It is also compatible with various devices, being fully responsive. The creators of this theme, MuffinGroup, are highly appreciated developers in the Envato marketplace. 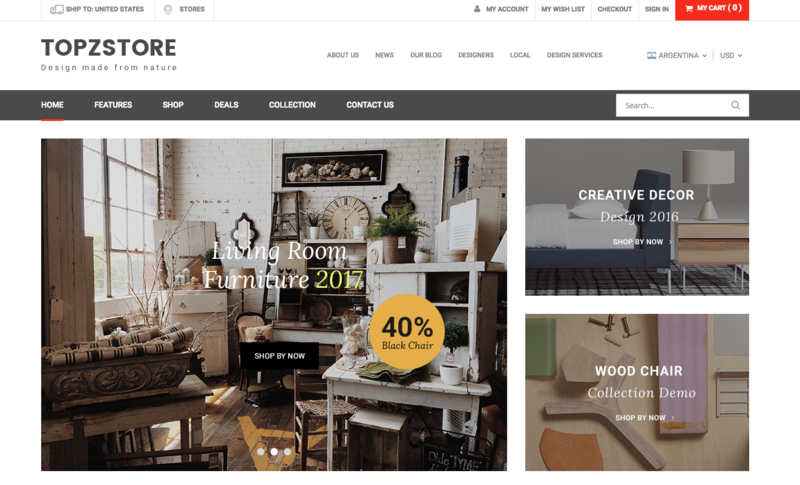 Aspire is a multipurpose theme which will make an excellent starting point for your online store. It is fully responsive, thus easily adjustable for smartphones, tablets, desktops & any other devices. Your site will look magnificent thanks to the unlimited choice of color as well as integrated google fonts for buttons, titles, headings and so on. Multiple language support will make your store available for users all over the world. 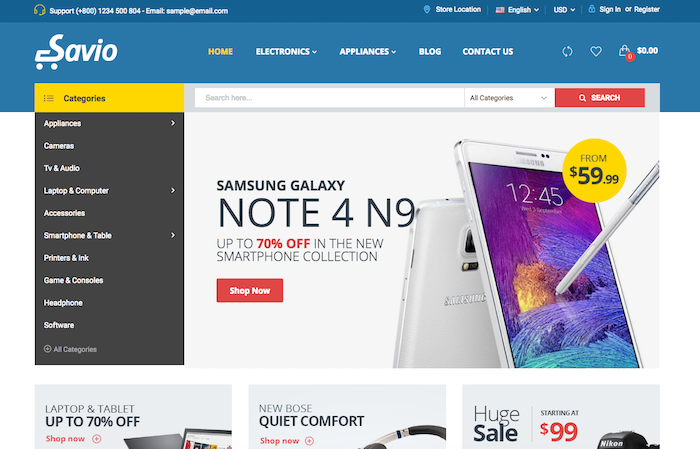 Estore is an outstanding and highly flexible theme brought to you by 7UP. It has the responsive design that will make your site available on any device, including mobile phones and tablets. Moreover, it is compatible with various browsers. The theme helps to customize your online store with the help of two layout types, integrated FontAwesome, Google fonts and Twitter bootstraps, all topped off with the limitless set of colors. Cloud Zoom and Fancybox will enhance the shopping experience of your customers. 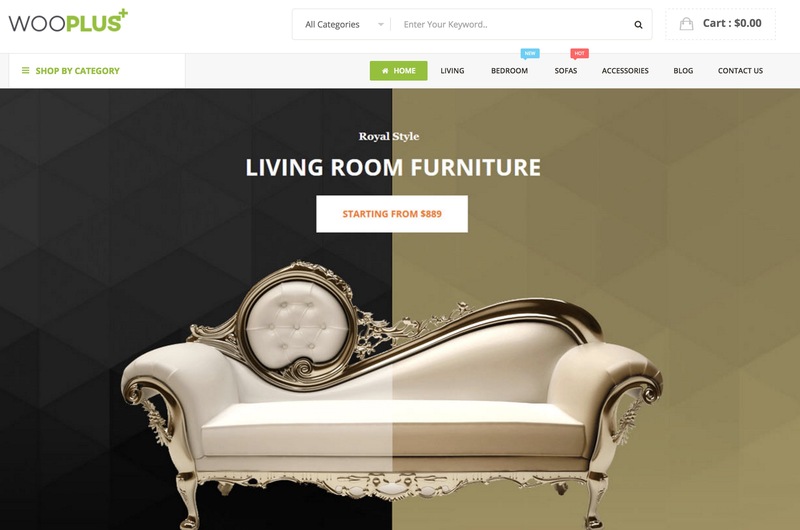 Expert is a platform that is designed for selling fashion, interior design items, furniture products and related products. It can be easily customized to suit your specific design needs. There are four completely different layouts, so you can arrange the width of the site, content area, and sidebars. Using the integrated google fonts or the custom ones, you will make your design even more unique. 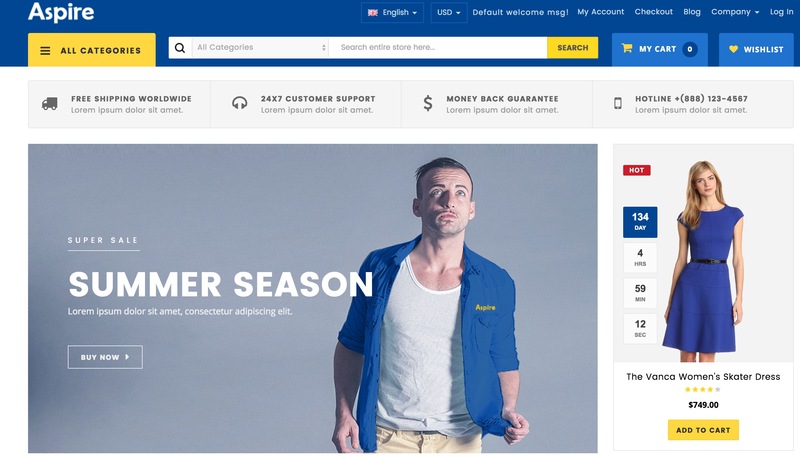 The theme is translation-friendly so that visitors from multiple countries will be able to browse through your store. Revo is a fully responsive, SEO optimized template that gives you a choice of four unique Home Page designs and 12 bonus pages. You can customize the layout of each page to include one, two or three columns and display more content in the multiple sidebar blocks. With the Ajax Add to Cart, Compare and Wish List features, you can give your customers a professional online shopping experience. And the powerful admin panel lets you make changes to your online store without any knowledge of code. If you want more control over the design of your store, Porto will give you everything you’ve always wanted. Aside from several different layout options you also get unlimited Headers and colours. Want more? How about fully customisable category pages that can display anything from two to eight columns? The theme is also fully compatible with the most desirable Magento extensions. 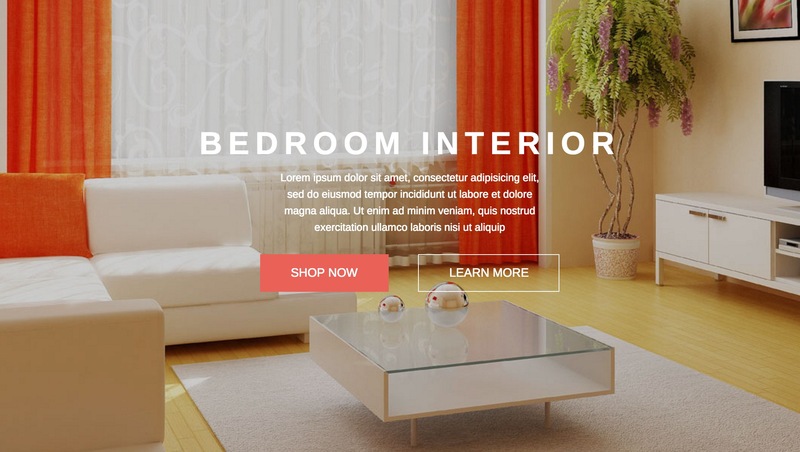 There really is no limit to the websites you can create with this template. With this template you can create a clean and modern website that delivers a great user experience. Choose from nine layouts, nine headers and five footers to get the foundation of your store up in minutes. There are also 40 custom HTML pages including About, FAQ, Warranty and Blog that you can add to make your site look professional. Built on Bootstrap 3 and SEO optimized, your site will perform exactly the way you want it to. 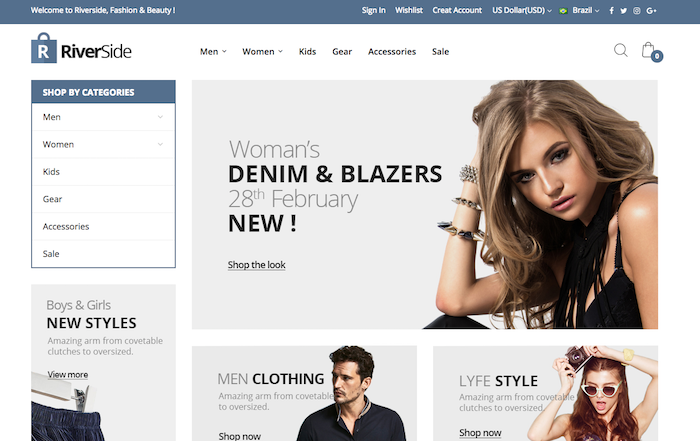 And that brings us to the end of our premium Magento themes and templates collection! Have you had the pleasure of trying one of the above themes out yet? If you have, how did you find it? Was it everything that you hoped for, or did it fall a little short of the mark? Did it play nicely with your website hosting service? As the year comes to an end, we’ll be checking out a whole host of new Magento templates for personal and professional uses – and we’d love to hear your recommendations and comments. What do you think of our theme choices? Have we missed your favorite one? We’d love to hear all of your feedback and questions in the comments section below!